We like to pick up on new trends and the newest one out at the moment in the vegan world is the breakfasts. Though many people do not think there is much option in the way of breakfast for vegan’s they are far wrong! There are literally hundereds of options, in my humble opinion I honestly think there is more option than the meat eaters! We all know breakfast is the most important meal of the day for any dieter. Here we will give our top vegan breakfast idea for 2013! 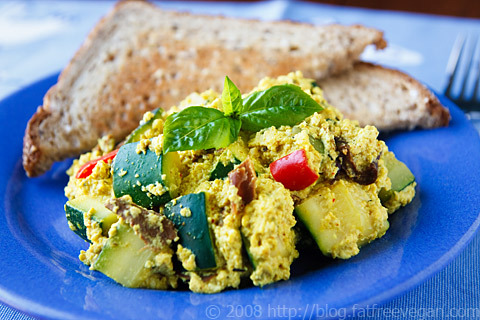 The good old Vegan Scrambled Tofu, a delicious delight to wake up to in the morning. This goes perfect with a couple of slices of Cobblestone Mill bread. Drain and mash up the Tofu then mix this with the yeast, Bragg’s, garlic and onion powders, turmeric, salt then set aside. In a skillet heat the olive oil over a medium heat. Add in the sunflower seeds and cook for a few minutes stirring occasionally, add onion, green onion, garlic and peppers. Cover and steam your vegetables until slightly tender (May take 5min approx.) Stir occasionally. Remove the cover off the vegetables and set them aside and add in half of the tofu to the pan, stir, then add the rest of the Tofu to the pan and the cover once again. Smoother out the veggies over the top with a spatula in a pan until brown on the bottom then flip with the spatula. Repeat this step until cooked to your preference. Turn heat right down to low and cover the scrambled tofu with the monterey jack cheese, place the cover on the skillet and allow to melt. You can adjust the peppers, garlic and other spices to taste. Just have a little mess around until you get it perfectly to your taste!